Everyone is positively giddy with the weather here in Northern Ireland. From visitor to local, the mood feels festive and joyful. Since I arrived exactly one week ago, it has been sunny, and warm-ish. Certainly not what one expects when you hear the words Irish and weather together. Sure – one needs a jacket in the early mornings and evenings, but during the day the outdoor patios are full, and everyone is talking about how lovely it is. Taxis drivers ask us - “how do you like the weather?”, like it’s the normal state of affairs. We didn’t even mind waiting 40 minutes for our hop on hop off bus today, and some of us have sunburns from being outside all day. And the forecast for the next few days is the same. 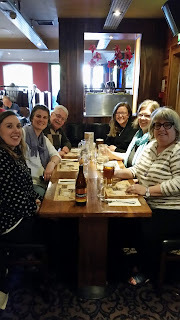 Everyone arrived safely at the Farset International Hostel by the appointed time yesterday, and after introductions and checking in (not everyone had met), we headed out for dinner at Robinson’s, a local restaurant/pub complex near the city centre. That’s us – from left, clockwise – Alana, Katie, Lance, Karen, Diana and myself. 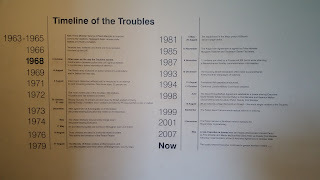 We began Sunday at the Ulster Museum, a beautiful place with a wide and eclectic collection of exhibits, including one on The Troubles. 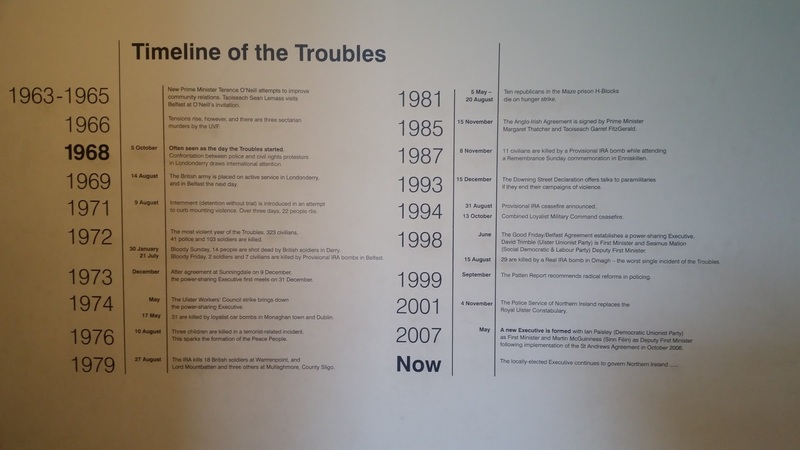 A “Timeline of the Troubles” – a helpful overview, is pictured below. Folks also took the time to stroll through the adjacent beautiful Botanic Gardens where they mingled with families, students, and local characters before having a bite to eat in the café and then heading off the city bus tour. Plans for the week include meeting our facilitator Paul Hutchinson and Corrymeela staff at the Belfast office on Monday, having a walking tour of the area, and then heading up by bus to the Corrymeela Peace and Reconciliation Centre in Ballycastle, about an hour outside of Belfast on the northern coast. After day one, curiosity and the hunger for learning is high. Many questions have already been articulated about this country’s history, social structure, and future. Perhaps we will get some rain by the end of the week, but the first two days have been glorious!